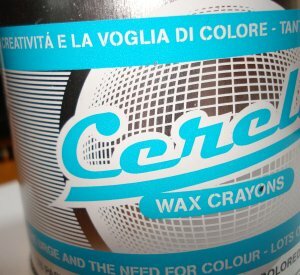 Similar in form to Pastellini colour pencils, Cerelli wax crayons are a fun set of 76 crayons in a cylindrical tin with a clear lid. 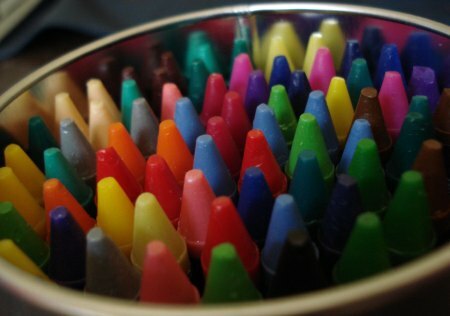 Crayons have never looked so fashionable. This is the second anniversary of this blog. A final step may be the end of forwarding from pencils.smoky.ca in January, 2008. An odd thing happened in September – after several months of consistently being one of the top ten results when searching for “pencils”, the blog seemed to disappear from search engines. This is despite forwarding from the old domain. My understanding of this is that multiple (or even two) domains pointing to the same content is a condition flagged by search engines as suspect. So, please update any old bookmarks or links you may have. This blog has been in a personal domain the last couple of years, but I think it is time to graduate to digs of it’s own. If all went well, all previous links should work, redirecting to the new domain. It’s great that Australia still has a pencil manufacturing plant (Staedtler). There were a number of pencil plants in Canada some years ago, but they have all since departed. Going way back, Thoreau’s pencils used Canadian graphite for a while. Today, the Pink Pearl eraser seems to be the only Canadian made pencil item I can find. Papermate sells a “Canadiana” pencil – but it’s imported. All the branded pencils are offered by German companies – Staedtler, Faber-Castell, Stabilo. I’m not sure what that means, but I’m somehow surprised. The Tradition 110 would easily be my choice as the best of the lot. Most of the pencils are average. I like the idea of a series of reviews, but the average pencils were challenging to write about, so I’ll be more selective before trying this approach again. And for anyone who has read this far – the server stats tell me the blog readership grows monthly, and it is among the top results in many Google searches – but the comments and discussion don’t reflect this. Would anyone be interested in either a mailing list or forum devoted to pencils? Another format might be better at preserving some of the accumulated knowledge and opinion, and encouraging discussion. 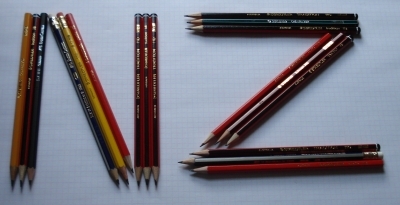 Announcement: August is New Zealand/Australia pencil month! It’s with great excitement that I am able to announce New Zealand/Australia pencil month here at pencil talk. Thanks to Dave at Dave’s Mechanical Pencils, I have a nice assortment of woodcase pencils from Auckland, New Zealand. None of them are generally available in North America, so this will definitely be of interest to many readers of this blog. Sorry for recent downtime – a blast of freezing rain knocked down the line connecting the www.penciltalk.org server. We’re now back up and running!